Arrival at Chandigarh railway station / airport & leave for Kasauli. En route visit to Pinjore Garden & Reach Kasauli, one of the beautiful and lonely Hill region of Himachal. Evening spend time by visiting Monkey point. O/N Kasauli. After Breakfast leave for Narkanda, beautifully located with thick woods, and the majestic view of Hatu Peak. Evening free time at leisure to explore this small tiny village. O/N Narkanka. After breakfast leave for Sarahan by enroute visiting the exquisite palace of erstwhile Maharajah of Rampur Bushair Explore the town and then leave for the beautiful village of Sarahan, perched High above the river Sutlej, Sarahan is steeped in legend, hill architecture and the remarkable natural beauty, orchards and small villages. O/N Sarahan. Explore the vicinity around including an ancient Kamru fort & temple dedicated to Nages God. Visit to Chitkul, a Last Village on Old Indo – Tibetan Trade Route. Walk through green orchards and brilliant stream. O/N Sangla. Morning after breakfast leave for Nako Lake, this is one of Kinnaur`s most picturesque hamlets, Nako is slated to be declared a heritage village build around a small lake and has an important Buddhist Gompa and a small temples, A footprint like impression on a rock is ascribed to the saint Guru Padmasambhava. O/N Nako. After Breakfast leave for Tabo by Visiting Nako Lake. Tabo, One of the most important gompas, not just in Spiti but in the whole of the Tibetan Buddhist world. There also's modern gompa and painting school founded by the Dalai Lama. Even Today Tabo holds the distinction of being the largest monastic complex in Spiti, constructed in 996 AD. En route Dankar Gompa. O/N Kaza. 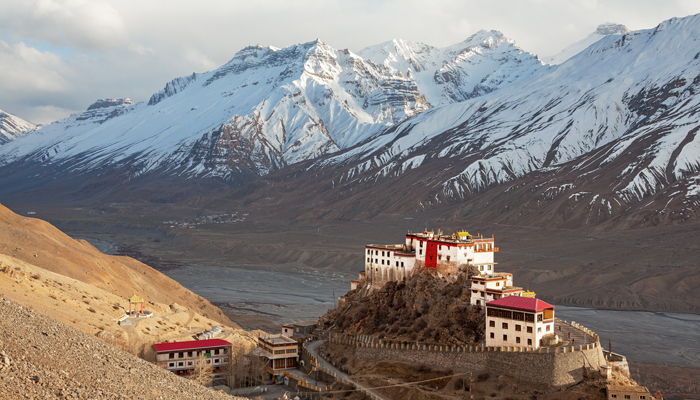 After Breakfast leave for Kaza Sightseeing by visiting Ki Monastery & Gete Village (Highest Motorable Connected Road in World) & Kibber Village for the ancient monastery built on what is believed to be have been a crater of an extinct Volcano. The Gompa situated above the village is one of the best preserved in the region. On the return journey to Kaza you are rewarded with some excellent views of the Damul Village. O/N Kaza. Morning after breakfast leave for Chandratal Lake by crossing Kunzam Pass (15,100ft) reach Baltal, change a vehicle to Sumo to proceed to Chandratal lake. On a way have a magnificent view of CB Ranges Peaks. This Deep Blue Water Has A Circumference Of 2.5 Kms. This Is The Source Of The River Chandra According To Some Believers, This Is The Spot From Where The God Indra`S Chariot Took The Eldest Pandava Brother Yudhistra To Swarga To Heaven In His Mortal Form. Full day at Leisure to enjoy the beauty of beautiful lake and natural surrounded Snow peaks. O/N Camping at Chandratal Lake. After Breakfast leave for a nice long drive along the Chandra River, which later becomes the Chandra Bhaga at the Confluence in Tandi Bridge. The landscape is barren all around while the valley floor is lush green with fields of Barley, Potato and Hops fringed with trees of Willow & Poplar. En-route stop at tiny hamlet of Chattru for refreshment. O/N Keylong. After Breakfast leave for sacred sites of Triloknath & Udaipur, Both Hindus & Buddhist revere these. After visiting these exquisite temples, leave for Manali through Rohtang Pass 13050 ft, Reach Manali by Evening. O/N Manali. Morning after breakfast leave for Chandigarh. Drop at Railway station or Airport. Journey ends here.